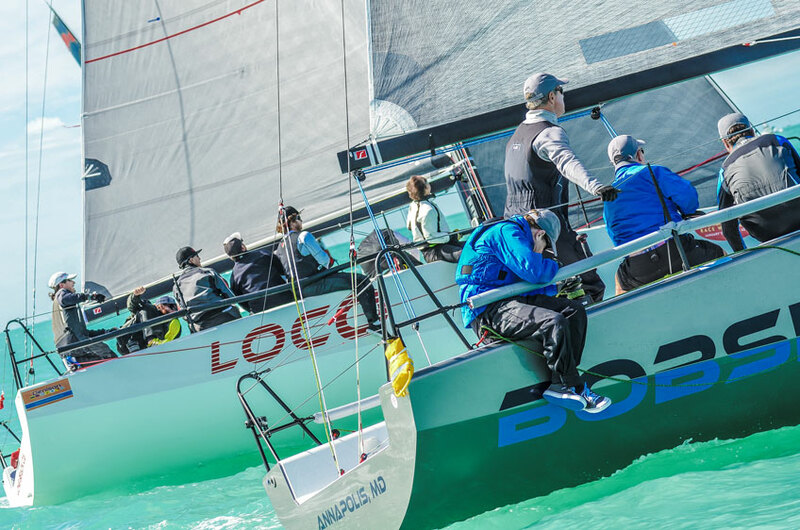 Quantum's Director of Offshore One Design, Scott Nixon, has spent the week sailing with the new C&C 30 team Bobsled at the Quantum Key West Race Week. We checked in to see how their week has been going. Team Bobsled on Wednesday at the Quantum Key West Race Week. Photo by Sara Proctor. With the fast approaching massive winter snowstorm heading for the Bobsled's hometown of Annapolis, Maryland, we knew that Wednesday would be a good day to go sledding. Quantum Key West Race Week is serving up some chilly and windy conditions this week, and the teams are loving it. Monday started out with a northerly breeze in the 18-22 knot range, and many teams - including our new team on the C&C30 One Design Bobsled - were caught a bit off guard. High winds and big waves are new to our team, and while we had good speed around the track, we lost a lot of points to boat handling issues, especially the dreaded spinnaker set and douse. Tuesday, the RC wisely kept the teams on solid ground as the winds were steady in the high 20s all day. The Bobsledders used the day to review video, look at sail pictures and review our boat handling process. We updated our boat set up and put together an order of operations for out sets, gybes, and douses. It paid off as Wednesday's conditions were classic Key West conditions with a post frontal north easterly in the 12-17 knot range. Bob Moran, the captain and team leader of the Bobsled, had solid starts. Our speed team, led by Mike Coe, kept us in control of our own destiny with great boat speed both upwind and down. The Bobsledders improved our boat handling 100 percent, and were much more competitive in the boat-on-boat situations. Helmets off to a job well done, holding a solid 3rd place standing at the end of Thursday to keep the sled on track in the 11-boat fleet. Looking forward to the final day of racing in the Conch Republic before we try to get home to the snow and some sledding with our kids! You can view all of the week's results here and get the latest information about the Quantum Key West Race Week here.